Not sure if anyone else was tracking these - shipping date has been all over the place and when it said unavailable until 20 December I was concerned I wouldn't be seeing one until 2019 but had a look this morning at they're in stock so I've ordered one: www.kegland.com.au/robobrew-65l-gen-3.html . Also not disappointed to find it is $650 vs the $799 price listed while it was out of stock for the last few months. kegland any chance of any ACB promotional deals - maybe a site sponsorship to boot? 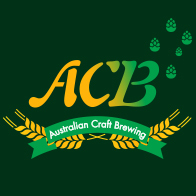 I think there were some initial communications between ACB and Kegland in relation to sponsorship and posting your wares without being a sponsor, and Kegland was not really heard from after that. I wouldn't really expect a response from them on this forum. 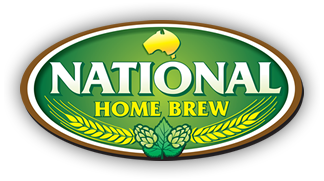 If you buy one from our sponsors you'll be able to go in the NewEra-SS Brewtech draw. What would the exposed elements look like? Can't see anything on their page. frodaddy interesting the video doesn't seem to show any exposed elements unless I'm missing something. Not that I'm promoting this in any way, in fact I bought the Guten which I guess is it's main competitor. I expect it would require a 15 amp circuit? Yes, to run it at Max Power (there's a simpsons reference for you) you do need a 15amp power point. fasdf I'd like to hear what the unit is like once you've put it through it's paces. What does the anchor mean in the tital of this thread? Yeah, it means a forum moderator has marked it to fall instead of the usual thread behaviour. Making it 'fall' seems little silly, what is the logic behind that? I want to see what the exposed elements looks like, I might be interested in upgrading to a larger single vessel and will have a 15 amp circuit in the new house. The original op did come across as an advertisement. 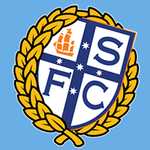 We do not want this forum to be another KL promotion site. Discussion of their products is fine, we are not here to dictate who you buy from, but I would hate to see our forum overthrown by constant advertising of products in just about everty thread. Our sponsors are great and I personally will do what I can to support them, in what is a tough enough market. Yes the anchor means that the post is marked to fall. I was not the one who added the anchor. It was probably not the intention of the OP but a part of the original post when combined with the way the title was written gave the impression of an ad for the product which is against forum rules. I suspect the anchor was added while admin and the mod team worked out the response to the thread. We don't want to stifle discussion about any brewing related product but we need to be aware of the line between that and promoting retailers, particularly those who are not sponsors of this forum. Once we have the thread on track I guess the anchor will be removed and the thread can be on it's merry way. By all means continue to discuss the product. Yes, I placed the anchor while things got sorted. We don't have to moderate often here but this method is better than locking or hiding the thread. Anyway, enough of this talk of moderation etc, hopefully this has slightly cleared the muddy water. Looking forward to the discussion of this product. Just got word the PHBS BB has been shipped. So should have it in a couple of weeks. Will report back once I have put it through it's first brew. Undoubtedly these will in time become available from some of our sponsors, and I dare say will be quite popular with the new to Ag brewer. The process very similar to the GF and Guten, and price point at around that of the Guten it will be interesting to see how quality and control systems stack up across these systems. If I was just dipping my toes into AG this would certainly be on the list to look at, but the GF with it's wifi controller and solid build would probs tip the scales(love my tech). Will be interesting to see if the Robo and Guten follow the same path as the Braumeister, and Grain Father, and follow up in the next year or two with wireless controllers. I already have too many brew systems, and I built them with love and care(and some choice swear words) so it's hard to let them go. I might just wait for Gen V.
I agree, after deciding to move onto AG I looked at the GF but once I saw the intor price of the v3 RB it was an easy decision. It isn't perfect I don't bother with the step programming as it just doesn't work as intended and mine had to be sent back after it's first brew but I couldn't fault the warranty service and haven't had an issue since. 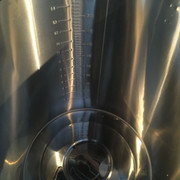 If the 65L is more of the same then I will be pretty happy at the price point.It makes good beer, is cheap and shiny. Assuming everyone's moved on from whatever happened to this thread earlier... I have received my Robobrew 65L and have a few initial observations having assembled it and done a cleaning run this evening. - Everything seems to work fine. I tried all of the elements, pump and controller and things worked as expected, the ramp time to 80degC with 3500W seemed comparable to my old setup using 2x2200W elements (in a thinner, wider pot). I haven't used a robobrew before so will spend some time working out the timers/steps to see how they work with my brew day. - The construction is solid. Malt pipe is many times more rigid than my current 56L slotted pot. The return pipe seems to be fixed to the urn well. - The deconstruction for cleaning is excellent. 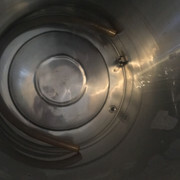 Everything comes apart and if I wanted to I could probably remove the top rack of my dishwasher and give everything (malt pipe, 3x screens, lid etc) except the urn itself a run with hot PBW. Concealed elements beat cleaning sticks any day. - The switches for pumps and elements attempt to be water-sealed. The rubber on the 500W element switch isn't finished quite so well but it still appears to seal against the urn. It's nothing major but I'd probably prefer if there was a shroud to divert liquid over the side of the element from touching these. I might try and add a small V-shaped bead of silicon to address this. - There is a lip at the base of the unit that collects liquid if anything drips over the side of the urn. This is the same as my cheapo 30L urn and probably not a surprise but worth noting that if liquid were to collect here and not be properly drained/aired it would probably rust (as with storing pots with rolled lips inverted with water pooled). - The filter screens are very tight fits. I would prefer if they were ringed by silicon to avoid scratching the lovely stainless but for the price I can't complain. I might rig something up out of a $2 mat from ebay. - I didn't check the volume markings, but the deadspace on a (probably not level) surface seemed to be around 2.5L which is pretty much what I want. Better than the ~4.5L in my current 82L pot. Not sure when I'll have time to brew but will hopefully give it a run within a few weeks to get to know it properly and make something to stay hydrated over the summer. I'm thinking a 50L batch of west coast IPA would be a good start. fasdf You need to post some pics mate so we can see the whole element arrangement and such, glad your happy with the kit and it's doing stuff it's should. First brew out on a new system I usually go a brew I know well so for me, LCBA clone I used to knock out doubles of continuously, that way you'll have time to make any adjustments and it will also give you something to measure the day against. maltjunkie brewing my hazy IPA as we speak, just had a thunderstorm roll through to make the first mash that bit more dramatic. I hit bang on 75% mash efficiency as I estimated with beersmith using a 50L brau profile... got a bit eager and didn't check all of the volume markings as planned but as I'm approaching a boil things are going well. Malt pipe a lot nice to remove than my old 56L pot - mostly due to the rigidity and tacked-on feet to park it on top of the boiler. I haven't taken many photos so far today but took a few of the unboxing / cleaning run last night that show the elements and screens. I'll put them up when I relax with a beer later. Nice work mate, certainly get a few post brew ales in before chasing pics up, sounds like things went well. So delays on release of this may have achieved something. Look forward to to hearing and seeing some detail. Understand waiting, I'm doing the same with my 6L keg pictures. Beer isn't quite carbed yet, so close and I want the best pictures too. And a large dose of CBS on top. Had a reasonable brew day in the end, considering there were 3 storms that rolled through and the one that arrived around the time of my flameout hop addition was raining sideways. I already had to delay and then extend the boil to deal with other distractions so I'm reasonably pleased that I slightly exceeded my expected gravity and just undershot volume. - The unit comfortably held a boil with just the 1kw + 2kw elements running. - The bottom 2mm stainless screen (which sits beneath the malt pipe) was a lifesaver. 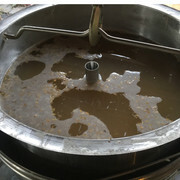 I realised after mashing in that I had milled too fine and there was some flour; though running off liquid through the pump or tap both showed very little particulate so I figured things were ok. 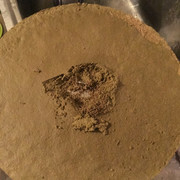 When I went to clean up the bottom screen had 1-2in of compacted hop matter on it, sitting on a thin layer of what looked like flour. There was very little trub beneath this screen. - No element scorching or problems running off. 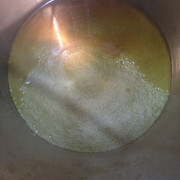 - The pump seems happy enough to pump boiling wort. After a few seconds the liquid changes to superheated/steaming water so probably not much point to doing this. - The pump doesn't have enough power to run a decent-looking whirlpool (compared to my old march pump) but the trub still coned reasonably well with a 20min hop steep. I can't see how to upload photos on this forum, have just had a dig around and there's no option that I can see which allows image upload. Insert image wants a url to an external site... Am I missing something obvious? I use Image Shack to host my pictures. You upload them there then use the link in your post. Thanks! Didn't think to try that. Would be more intuitive if this was in the quick reply menu too. After rinsing - everything else went in the dishwasher and came up nice and shiny. I have a camlock fitting on my hot tap so it was easy to plug in to the pump outlet to backwash.